Simon Cregeen is Head of Child and Adolescent Psychotherapy in Manchester and Salford CAMHS, and Central Manchester NHS Foundation Trust. Carol Hughes, now retired, had a long career as a Consultant Child and Adolescent Psychotherapist within the NHS and social care. 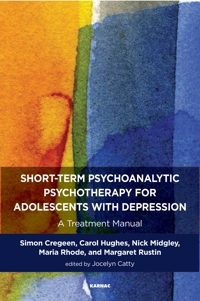 Nick Midgley is Academic Course Director of the doctorate in Child and Adolescent Psychotherapy at the British Psychotherapy Foundation/Anna Freud Centre and Lecturer in the Research Department of Clinical Educational and Health Psychology, UCL. Maria Rhode is Emeritus Professor of Child Psychotherapy at the Tavistock Clinic and the University of East London.